Tondo Youth. Courtesy of Stefan Christoff. "We have a culture of forgetting... These photographs are testimony to not wanting to forget," says Filipino author Miguel Syjuco, whose literary debut Illustrado won the 2008 Man Asian Literary Prize and will be published this May. On the 111th anniversary of the Philippine-American war and vernissage of Stefan Christoff's On Movements in Manila exhibition at Kaza Maza, Syjuco's words acted as a reminder of the reality that these photographs represent. 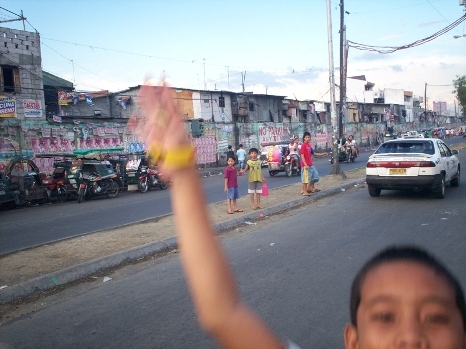 "Photography allows space for reflection, and in the context of the Philippines, photography presents an opportunity to capture the situation on the ground in Manila," says Montreal-based journalist, activist, musician and photographer Stefan Christoff. "The photos that are on the walls at Kaza Maza are an attempt to go beyond the political reality to capture the feeling of Manila, the realities in the urban landscape." 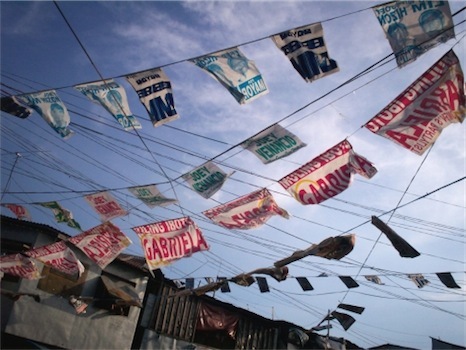 Political campaigning during the 2007 elections along improvised electricity wires in Tondo slums of Manila. Courtesy of Stefan Christoff. Colorful and striking, Christoff's photos depict the human impacts of economic inequality in the Philippines. The majority of Filipinos live below the poverty line, and according to the U.N. more than 15 million people--that's roughly 50 per cent of the country's population--survive on less than two US dollars per day. Economic disparity has lead to increased political unrest, channeling grassroots support towards progressive liberal political parties. With the eye of both a human rights observer and a skilled photographer, Christoff deftly captures the underlying struggles and spirit of one of the largest metropolises in Asia. "I was interested in what the feeling of the city was, because it's an urban center in the global south that never sleeps. It's always going, 24 hours per day," says Christoff. Through Christoff was involved with the Montreal Centre for Philippine Concerns, supporting Filipino immigrant workers and caregivers in Canada, he never expected to go actually go to the Phillipines. But in 2007, Christoff was chosen for an International Observers' Mission--a global effort comprised of activists from around the world during the lead-up to the Filipino midterm elections. The activists were stationed in districts around the country where political corruption and killings were rampant. Christoff explained that the Philippines is one of the most dangerous countries in the world for journalists, and that there have been systemic killings targeting progressive activism throughout the country since 2001 when current president Gloria Macapagal-Arroyo came to power. Smoky Mountain I. Courtesy of Stefan Christoff. Manila's widespread economic disparity is most poignantly depicted in the Smoky Mountain series. 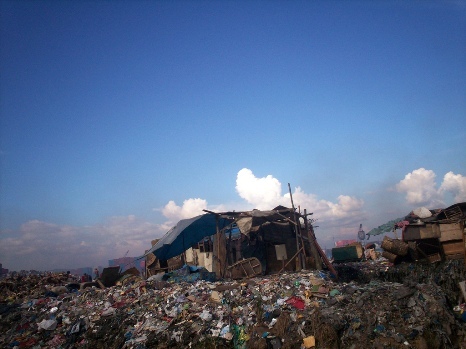 Several of the photographs at Kaza Maza depict Smoky Mountain, an urban community in a garbage dump struggling without everyday life necessities. The members this community make their living sorting, collecting, and burning garbage. 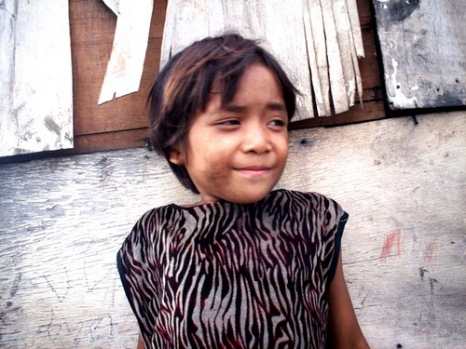 Next to the photographs of Smoky Mountain is a close-up of a young girl who lives there, giving the slum a human face. Eyes of a Youth in Manila. Courtesy of Stefan Christoff. "There's intense poverty. But in the face of that poverty there's also intense resistance and struggle for a better life waged by movements across the country," says Christoff. "What for me was astounding was to see the profound dignity and determination that the people had in Smoky Mountain and across the Philippines. That dignity and determination was a struggle for change."